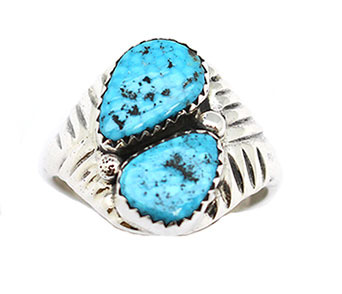 Sterling silver sand cast shank with 2 free form turquoise stones set in bezel. The shank has line / grove designs and tapers to a thin bottom shank. Top measures approximately 3/4" long by 1/2" wide. Stones will vary in shape and size and even type of turquoise. Currently available in sizes 8 thru 11 1/2. Choose sizes when ordering.